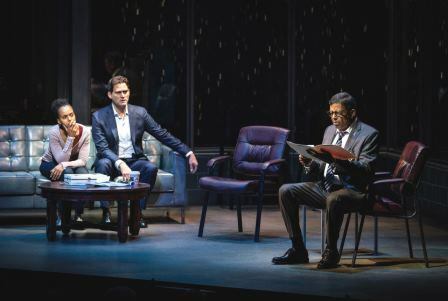 “American Son” premiered in 2016 at Barrington Stage in Massachusetts and was staged at George Street Playhouse in New Jersey in February 2017. In those recent years, its theme of racially-charged encounters between African-American males and law-enforcement officers reflected the burgeoning #BlackLivesMatter movement. Now, Christopher Demos-Brown’s cautionary tale has opened on Broadway, and what a difference a year makes. Or not. The title character, eighteen-year-old Jamal, hovers over every minute of the emotionally intense tale, but does not appear in person. It is 4AM in the waiting room of a Miami police station, where Jamal’s mother Kendra has gone to report her son missing. Jamal had left home earlier that evening in his late-model Lexus, a gift from his father, and had not checked in or answered his phone. Mom is deeply concerned, a state of mind made clear by Kerry Washington’s Kendra before she speaks a word. 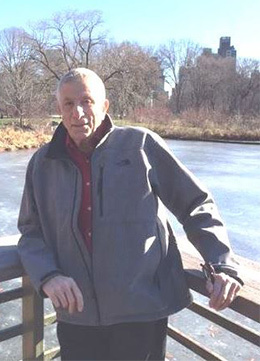 Having called-in veteran police Lieutenant Stokes, whom he had never met, Larkin is relieved when a white man with a gold badge clipped to his belt finally shows up. 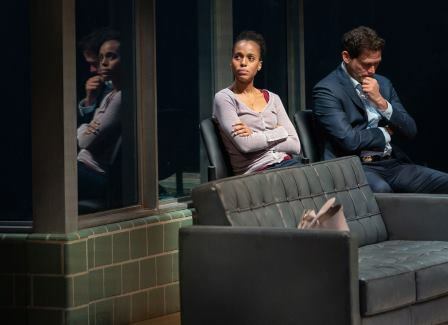 Surprise: after a few whispered un-PC remarks (which are amusing until they’re not), Larkin realizes that the man is Jamal’s father, Kendra’s estranged husband, who happens to be an FBI agent. While concern over Jamal persists, the tension between the separated spouses, concerning their marriage (and breakup), their racial identities and their disparate parenting techniques becomes central. 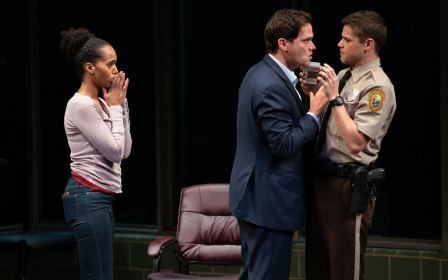 If frantic Kendra is over-written (as opposed to over-acted) in the early portions with the rookie officer, Ms. Washington and Steven Pasquale are very real as the conflicted couple. The anguished mother may be a stock character, but these actors balance the upheaval between them. It’s toned down a notch, and…real. Lieutenant Stokes does finally show up. Played by a deceptively low-key Eugene Lee, the professional veteran cop takes no guff. A physical confrontation involving antagonist Scott with the cops stretches credulity (FBI, after all), but it paves the way for an excellently played scene between Kendra and Stokes.